I slept pretty hard last night, and my body was like a weight this morning, but I still managed to get it up and hiking by 7:15. 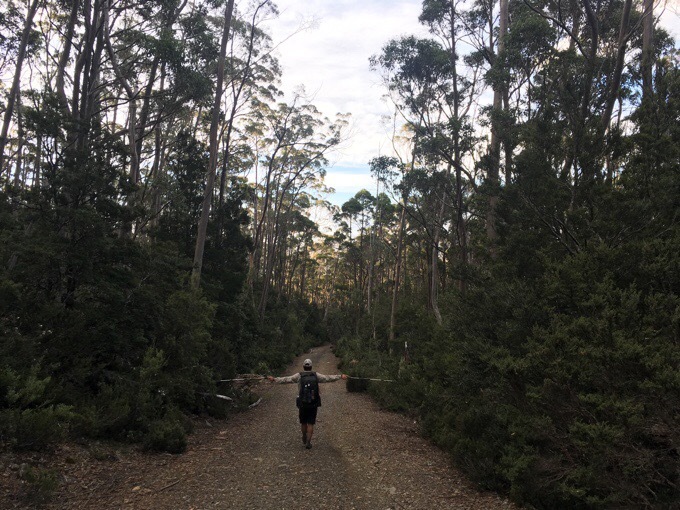 We had just a couple hours of hiking on the Port Davey Track back to the parking lot. 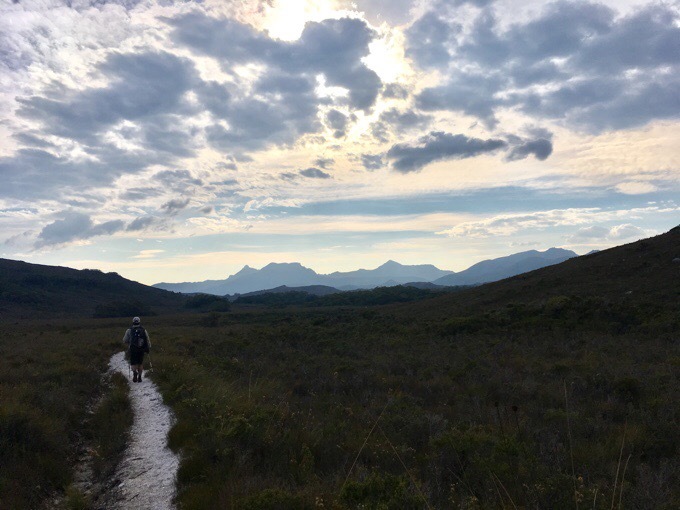 The route of the Western Arthurs Traverse is in a balloon shape, so we closed the circuit yesterday, and now are headed out the same muddy trail we came in on. Fortunately, it has been fairly dry the last four days, so it was a bit more solidified this time through. 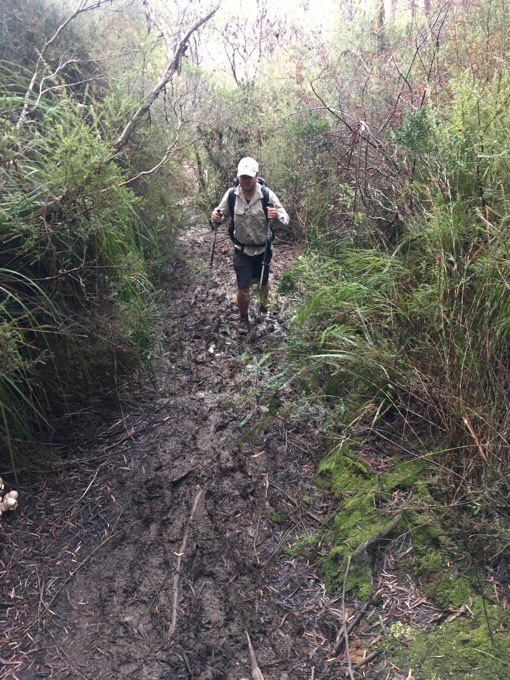 Still, there was no avoiding some sections with foot sucking mud. It just wasn’t as puddled or deep as the first time through. 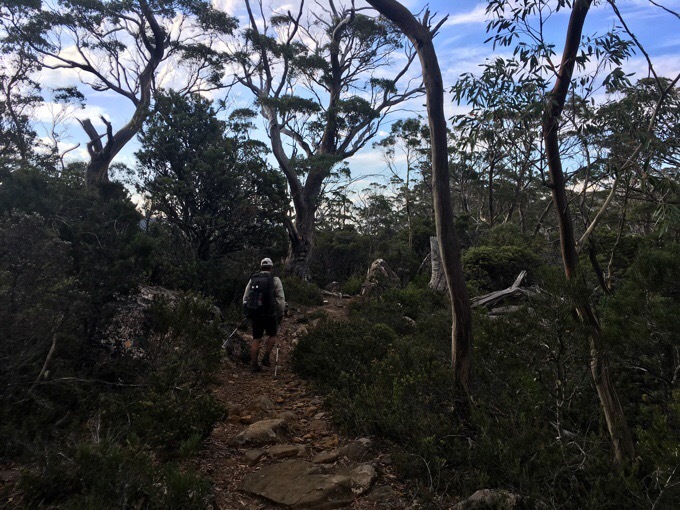 The original plan was to finish this traverse and immediately jump onto the overnight trip of the Mt Anne Circuit, which is very similar to what we just did. 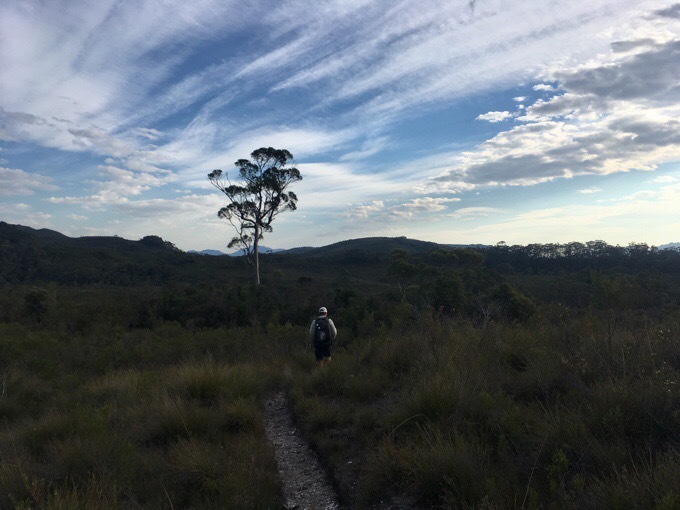 Yesterday, we both agreed that we’d gotten our fill, and that instead of the circuit, we’d rather do a day hike of Mt Anne that might be less arduous and have less brush/mud to push through. Mainly, it was the brush we want to minimize. We’re pretty over the brush. As we walked up to the car, Griggs mentioned how he wished there was a burger place between the two parking lots that are right by each other in the middle of nowhere. I totally agreed and said why not forget Mt Anne and go get burgers instead. 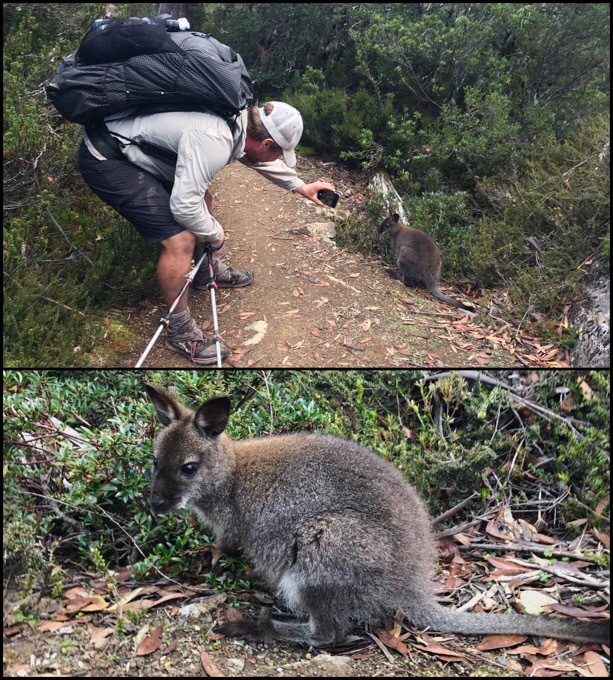 We both perked up greatly and were confident that we made the right choice to pass on Mt Anne. We both are in that transitional phase of being ready mentally for what’s next. We’re ready to move on. Griggs will start the Continental Divide Trail in exactly one month, and I’m ready for a few months of downtime back home in Portland returning to substitute teaching until summer comes. 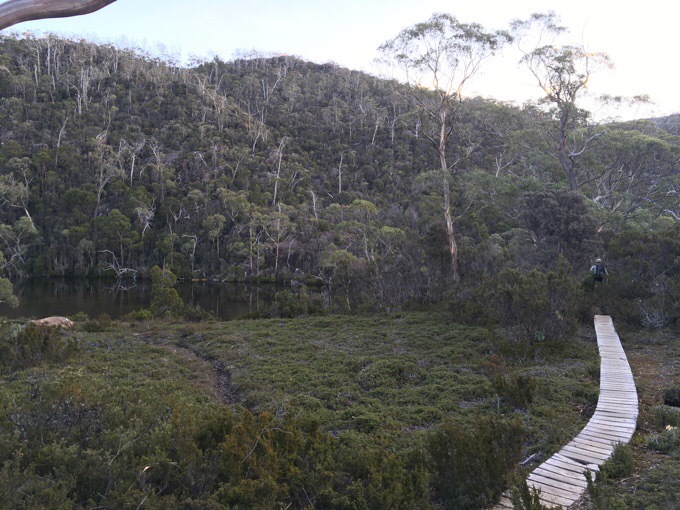 It isn’t that we aren’t really enjoying Tasmania, but it’s these last days having already shifted mentally to what’s to come and being excited about that. I’m loving the freedom of this type of travel and being able to change things on a whim given our moods or the weather. 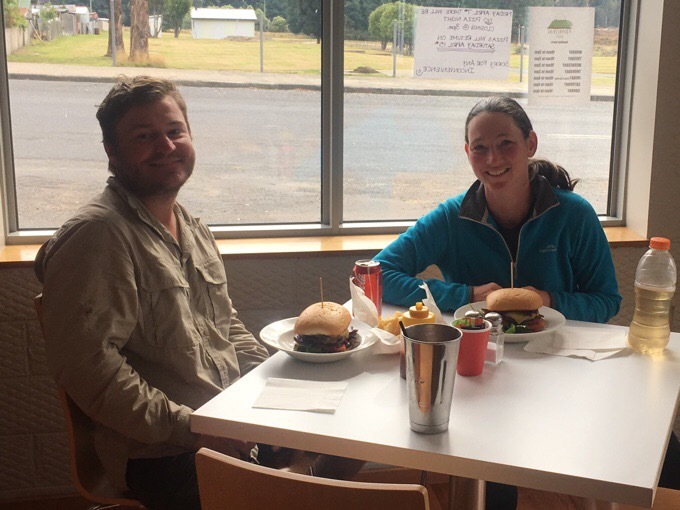 The burgers out in AUS and NZ are different than in the US, and I’m going to miss them. If you order a burger with “the lot” it comes with a ton of stuff on it that is quite delicious together and very satisfying for a hiker’s appetite. The ones we got today included the basic lettuce, tomato, and cheese along with caramelized onions, beetroot (I don’t get), fried egg, pineapple, and bacon (Australia style almost like sliced ham). It was just what we both needed! While at the cafe, we had good wifi, and I got to Skype with my sister and my youngest nephew Simon. He’s gotten on a late bedtime rut, so my sister was happy to have some late night entertainment for him. He was in a great mood and trying to give me many things through the computer. 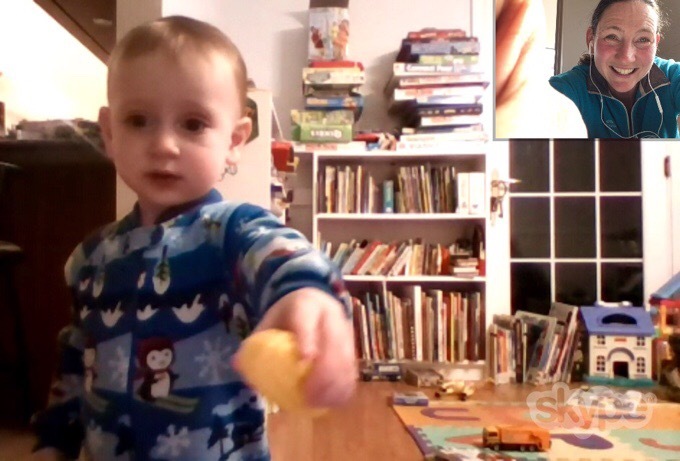 I haven’t been able to Skype with my nephews as much as I would like these last five months, and I’m looking forward to more of this adorableness when I return home. Here is Simon trying to give me corn. So adorable! We have four days left here, but just today and tomorrow are clear of rain for sure. 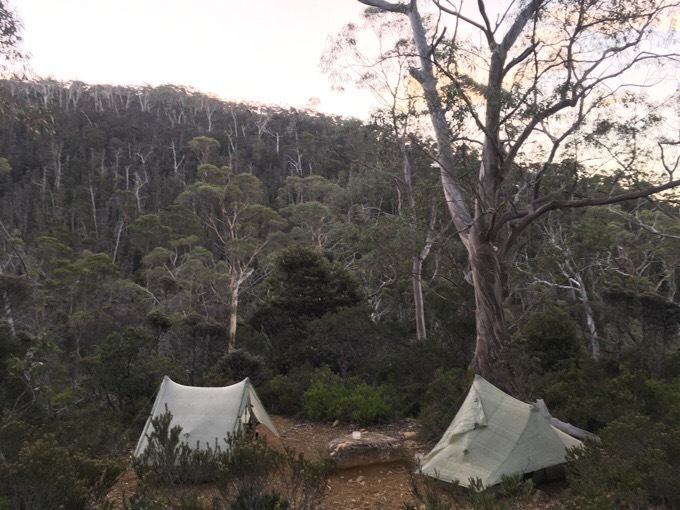 We decided that instead of spending it at Mt Anne, we’d rather go to an area we’d yet to explore, Mt Field National Park about an hour and a half outside of Hobart. There is a popular loop hike that we’d heard about that was exactly what we were looking for called the Tarn Shelf Circuit. After lunch, and soaking up some wifi, we drove to the Mt Field Visitor Center to get some info on the hike. Fortunately, a hiker we met earlier in this trip was able to email me some basic maps with distances. THANK YOU Belle! 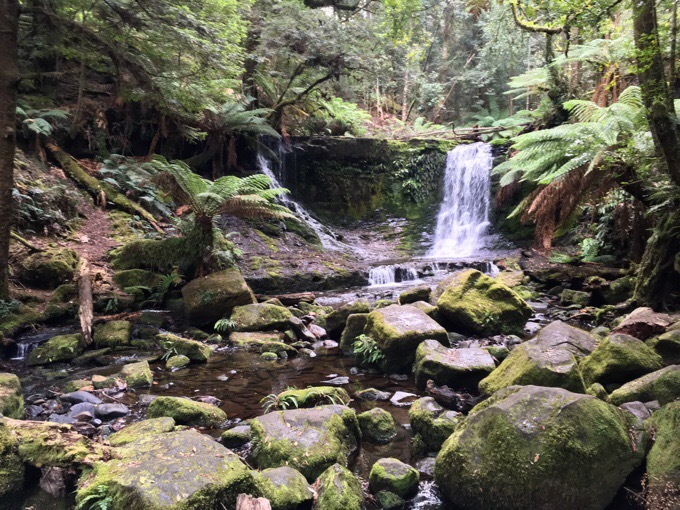 Before we started, we did a quick hike of one of the most popular tourist sites in Tasmania, Russell and Horseshoe Falls. 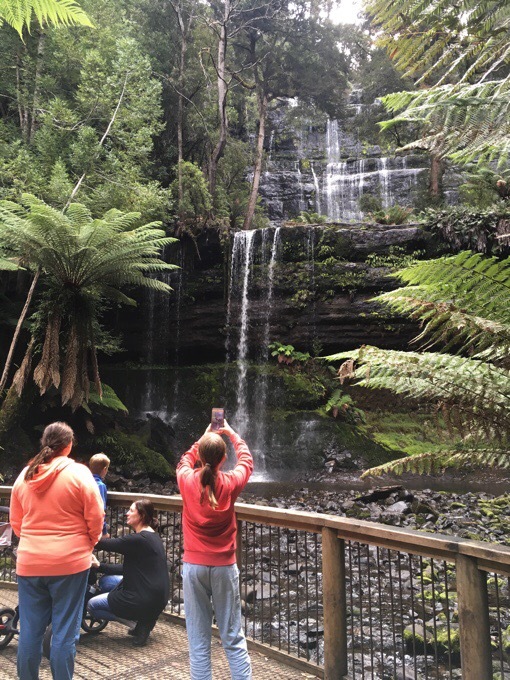 There were lots of tourists out, so it was tough to get a clear photo of Russell Falls. It wasn’t flowing very heavily, but it’s a super popular one. I actually like Horseshoe Falls more. It reminded me of the waterfalls back home in Oregon. 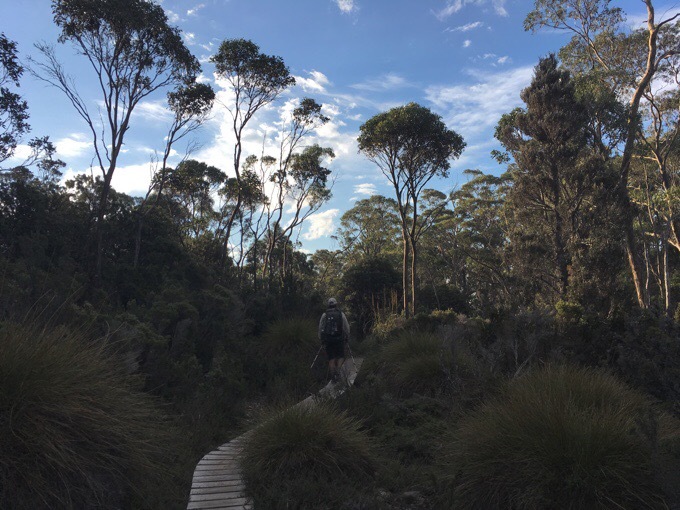 It was great to be on relaxing trails and just take in the sites on a clear and comfortable path. Then we drove the short distance to Dobson Lake carpark to start the Tarn Shelf Circuit. We only needed to hike in an hour and a half to get to the camping at Twilight Tarn at 5:30pm. It was such a welcomed change of pace to be on the maintained path. Our top qualifier for this loop was that it not have brush to push through. It lived up to that expectation and then some as it wasn’t even muddy! We were so spoiled. Yes, we were quite happy with this choice. I mentioned Griggs’s shoes are just barely going to make it, and I finally remembered to get a photo of them. Just a few more days, they can do it! 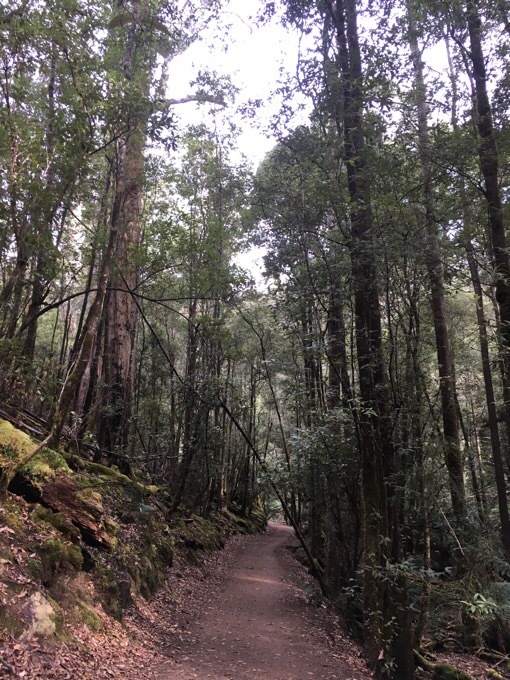 There was even a pademelon sighting soon into the trail. It was so habituated to people that it didn’t run away when we walked close to it. Here’s a fun pairing of photos of Griggs taking a photo, and the resulting photo. We are the only ones out here, and it’s nice and relaxed with a stream running in the near distance. 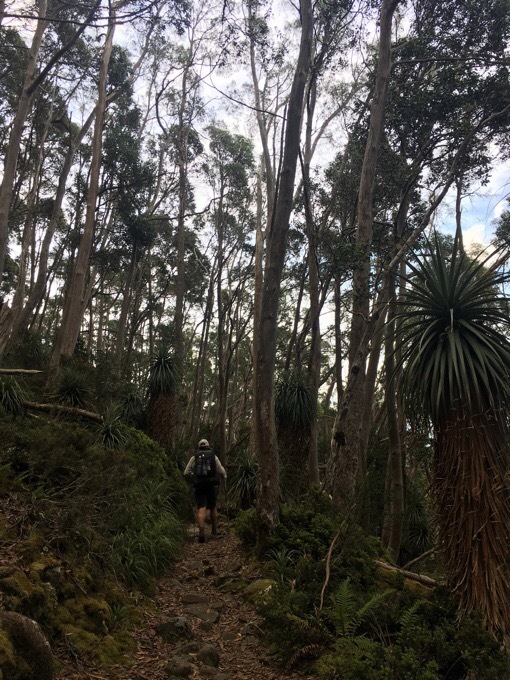 We noticed that we didn’t see any other hikers three days in a row on the Western Arthurs Traverse. I can’t tell you the last time that happened to me. It may possibly have been the end of the Great Divide Trail over a year and a half ago. That kind of solitude is really tough to find these days, and it was nice. 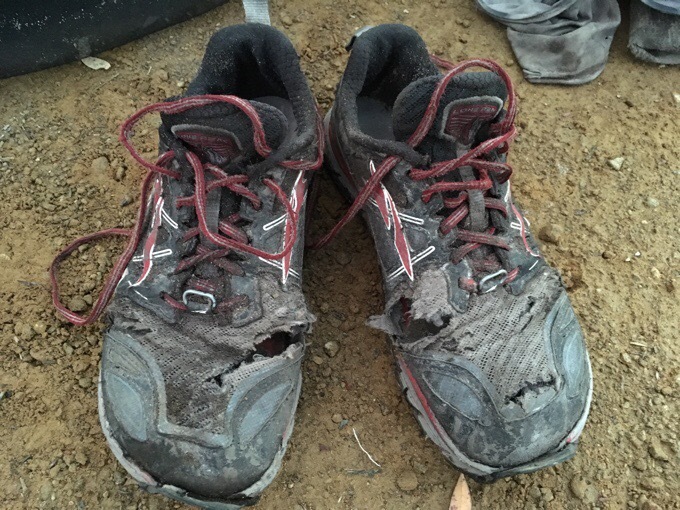 How many miles does Griggs shoes have on them? ! Guessing some of this recent gnarly terrain has sped up their demise? He got them in Queenstown, which was two months ago. So, less the mileage than that they have been through tons of brush in those 60 days. Luckily, I started with new shoes when we got to Tassie and I have them both stitched up already. It’s just not a hamburger if there’s no beetroot. It’s the color I think that bothers me most on the beetroot. I’m curious about your sock system. The pictures show how wet and muddy they get each day. Do you rinse them out at the end of the day? Do you rinse out your shoes? How many pairs of socks do you carry. How do you prevent blisters if you are wearing wet socks and shoes every day? I enjoy your blog so much I have no idea how I’ll cope when you are finished this trip. Here, there’s no point in rinsing on the muddy stuff. They just get muddy within 5 mins. I do have 3 pairs for this trip knowing they all had some wear already. I rotate them and hope that two days hanging on my pack (using safety pins) will dry out a pair so that I can at least put on a somewhat dry pair first thing in the morning. In the really cold stuff, I get a mental victory putting on Ziploc bags over the socks in the morning so they don’t get soaked in the wet shoes as soon as I put my feet in them. It’s inevitable, but such a victory if my feet aren’t numb as I take down my tent. Burgers with beetroot are the best! I bet your legs appreciated the change I terrain! I will also miss your blogs so much. We have become spoiled with this extended journey. On the other hand you certainly deserve the time off. Back home, some alarming trends that will affect hikers.. Harvesting of resources (water from springs in the Mojave is just one). I agree that the burgers were a good choice for both of you. Wow, no mud or bushwacking. Sounds pretty awesome. Can’t believe you’ve only four more days to go. Now that’s a real Aussie burger & beetroot is a must 🙂 I have to renege on the pineapple though 🙁 But that’s just me. Oh cool! Best of luck to you Bret! The PCT is my fav. So, so special!!! Hmm Brett just left today and Kristin was getting on a flight to San Diego from Canada.. both heading off on the PCT.. Will follow both, and hope they meet up. Brett’s picture on that potato chip thing .. I’d be terrified!! There are sooo many to follow at the start of a season!